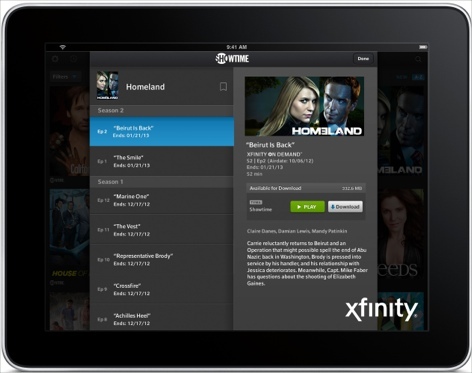 Comcast has announced that Xfinity TV subscribers who use the Xfinity TV Player app on their Android and iOS mobile devices can now download certain TV shows and movies, so they can watch when they're not connected to a broadband network. The download option closely mirrors TiVo's recently announced "Stream" device, which also allows downloading. As I wrote in my review of TiVo Stream, I think the offline viewing use case is a killer app. Despite the proliferation of 4G services, the reality is there are still plenty of times when connectivity is sub-par or non-existent, particularly in transit situations (e.g. airplanes, cars, trains, etc.). Further, the elimination of unlimited data plans by wireless carriers makes streaming long-form content prohibitively expensive. As a result, the download option is very attractive, especially for travelers. I've watched lots of great shows/movies through the TiVo app on my iPad since getting the Stream, as it essentially unlocks recorded content from the TiVo box. That allows me to watch when I want to, not when I'm lucky enough to find free time and wrestle access to the main TV with TiVo from my family. Video playback starts immediately, there's no buffering and it always looks great. The TiVo app's UI is excellent and I can quickly move from DVR to iPad and back to check on program availability. The only downside is these are big files, which rapidly fill up my iPad's capacity. Comcast takes things to the next level with Xfinity TV player; whereas with Stream you first have to record the program on the DVR (only certain models work), then open the TiVo app and download the content to the mobile device, with the Xfinity app, you simply browse the available selection, hit "download" and the process begins. The other thing is that with TiVo you have to buy the Stream device for $130 and connect it to your router, though there's no monthly fee. Comcast avoids an additional device because they're storing the content on their own servers, just as they do with VOD. As with TiVo, there's no additional monthly fee to download. There are a couple of catches however. First, as with all TV Everywhere authenticated services, you only get access to content on networks you subscribe to. And at launch the only content available for download is from the premium TV networks Showtime, Starz, Encore and MOVIEPLEX (note no HBO and no ad-supported networks). Contrast this with TiVo where you can record and download programming from practically all ad-supported networks, but not from premium networks. Within these premium networks from Xfinity, not all programs are included and for those that are, not all seasons are available. For example, only season 7 of "Dexter" and season 2 of "Homeland" on Showtime can be downloaded, though prior seasons can be streamed. Conversely, multiple seasons of Starz's "Boss" and "Spartacus" can be downloaded. A Comcast spokesperson told me that the company is working with programmers to add more content in the coming months. These types of inconsistent experiences have become the bane of TV Everywhere users, as rights clearances kick in over time. For parents, one big win here is that Starz allows downloading of Disney movies such as "Cars," "Finding Nemo," "Winnie the Pooh," "Brother Bear" and many others. Despite the recent Netflix-Disney deal, Starz retains these rights for another several years. This means parents can load up the iPad (or have their kids do so) and toss it in the back seat for long car rides. No more bringing along a portable DVD player, buying DVDs or paying for iTunes downloads. If your 4-year old wants to watch Nemo for the umpteenth time, it doesn't cost any extra. Although it's far from a complete experience for now, the new download feature from Comcast is definitely a step in the right direction (and one that hopefully HBO Go, Netflix and others will follow at some point soon). The reality is that today's wireless networks do not yet support true anytime, anywhere access to high-quality video, nor with any semblance of affordability. Until they do, the option of downloading is a compelling value proposition.